Does Your Staff Know WHO to Call in a Restoration Emergency? Being a facilities manager, business owner or manager brings a host of daily stresses. The last thing you need to worry about is whether your staff knows how to respond in a water or sewage restoration emergency. If a pipe breaks at 1 a.m. sending water streaming through the ceiling from floor to floor, will your staff know how to respond? The speed in which they react can make hundreds or thousands of dollars of difference. 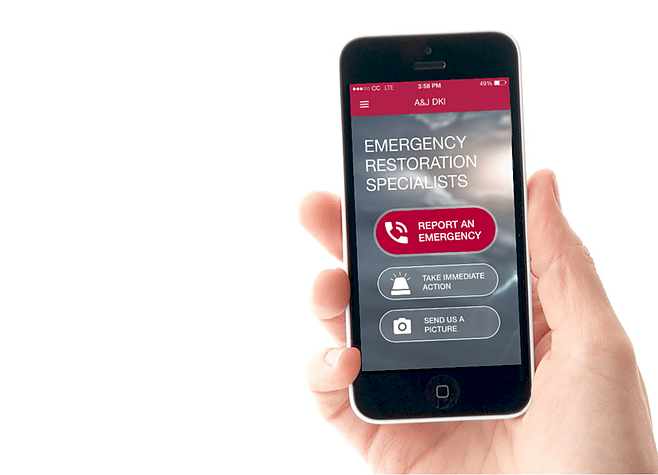 Our Emergency Restoration App is FREE. Our goal is to make sure you and your staff are prepared when that 1 a.m. disaster rolls around. Features in our water emergency app allow us respond fast, dispatch additional water technicians, and give early indicators to know what we’re walking in to. Check out this video for a quick demonstration on how the app works. Then download it for FREE in the App Store or the Google Play. Here’s what we’re inviting you to do. Have all your facilities staff and managers download the app. Discuss it in your staff meeting and show them how to use it. Then rest assured that your entire team will be able to get help 24/7 at the touch of a button. type “AJ DKI Restoration Services” in the search bar and download for FREE! Don’t let your business or commercial building’s restoration emergency planning slip through the cracks! We’d love for you to check out our True North Disaster Plan program. This disaster planning program allows us to sit down with you and prepare a plan ahead of time and access to member discounted pricing.